This might be the first film I’ve ever seen with Jackie Chan in a genuine supporting role. Since he started in films in the early 80s he has either been the STAR, the star, the co-star, or a mere cameo. There has been precious little in between. In an are in China where many warlords fought and struggled over territory and power, the Chinese Army were cruel and violent pricks – at least that’s how they are portrayed here. One of the worst of these was leader General Hou Jie, he callously orders the killing of innocent villagers for fear that they may possibly be harbouring the enemy, and the killing of the enemy because… well they’re the enemy (can’t argue that one). When his reluctant 2IC Cao Man expresses doubt at the level of violence and whether those targeted even deserve what is being dished out he receives an impromptu lesson: ‘it is better to be the aggressor and be wrong than the passive dead guy’, or something along those lines. On this day though they follow an enemy into peaceful monk territory, a Shaolin temple. While the monks refuse to take sides they will not allow violence on their turf, and they protect the man. Initially. Back in cautiously peaceful time Hou Jie becomes increasingly nervous about the prospect of being betrayed or attacked – even by his good friend and ally. In another unnecessary pre-emptive strike Hao Jie takes his friend out in cold blood purely to advance his own station and eradicate another potential rival and hindrance to his success. Unfortunately though Hou Jie’s actions and teaching eventually (and inevitably) work against him, his former 2IC Cao Man betrays him and Hou Jie must seek refuge immediately… but where? What follows is a generally rewarding tale of realisation and redemption. Jackie Chan (see how long it took to even mention him!) plays a humble and peaceful – yet eccentric – cook who kindly takes Hou Jie under his care. After a period of time Hou Jie embraces the life of a monk montage-style, shaving his head a la Britney for a clean start – albeit without the insanity – and finds peace… for now. Because meanwhile Cao Man has effortlessly and successfully stepped into his shoes and is now just as ruthless and violent a leader. Confusingly enough in a film about a violent and cruel man realising the error of his ways we always know that this pro-peace film will end in violence, and the action in the latter part of the film is worth the wait. There is an ax-fight that seemed quite realistic and dangerous, a chariot chase (of sorts) and the wire work was used sparingly enough to be forgiven for the most part. Andy Lau proves himself an adept and reasonably athletic martial artist, and there is no shortage of random monks ready to throw down… in self defense of course. It takes a long while but even Jackie Chan gets to try his aching muscles out near the end of the film, even though in truth his entire role and fighting scenes are thematically at odds with the rest of the film and stand out like a sore thumb. It is like Jackie has now entered the Brian Dennehy / Morgan Freeman phase of his career as the elder statesman, only every director – and perhaps even Jackie himself – can’t help but remember that he was once the pre-eminent cinematic martial artist on the planet, so they clumsily try to work him in. 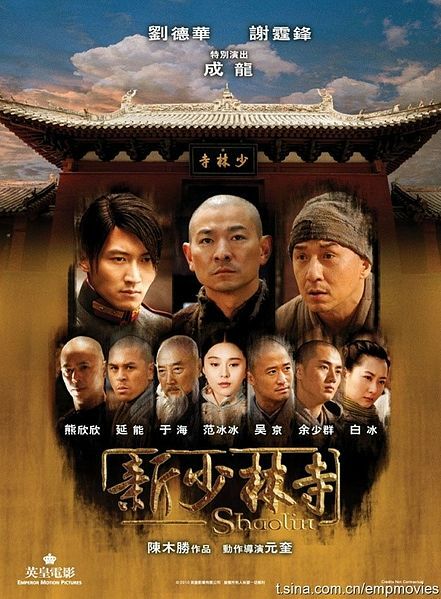 Shaolin is a film book-ended by violence, the redemptive tale in the middle is supposed to provide the moral of the story I guess, but that could easily be forgotten by the 30 minute finale that ends in many dead when even the monks say ‘enough’. Final Rating – 7 / 10. Muddled morals aside Shaolin is well acted, reasonably well paced (aside from one interminably long ‘will she / won’t she?’ scene that I can’t spoil here) and contains a few of the better martial arts sequences filmed in the last few years. This entry was posted in Film, Jackie Chan, Movie Reviews, Worthwhile Movies. Bookmark the permalink.